Now we’re going to focus fully on the state of the capitalist system. Today, capitalism is experiencing one of the most profound challenges in its history. Some leading thinkers believe that it might not even survive the current technological disruption. We’re going to take a look at some of the trends that are shaping that thinking and what the future looks like from a value systems perspective. What you see in front of you are quotes from different economists and political leaders from the last 100 years. Capitalism is good or capitalism is bad. Communism is good or communism is bad. Here’s my perspective: Instead of looking to defeat one ideology so another can rise, we should be defeating all ideologies so a better understanding of humanity can prevail. 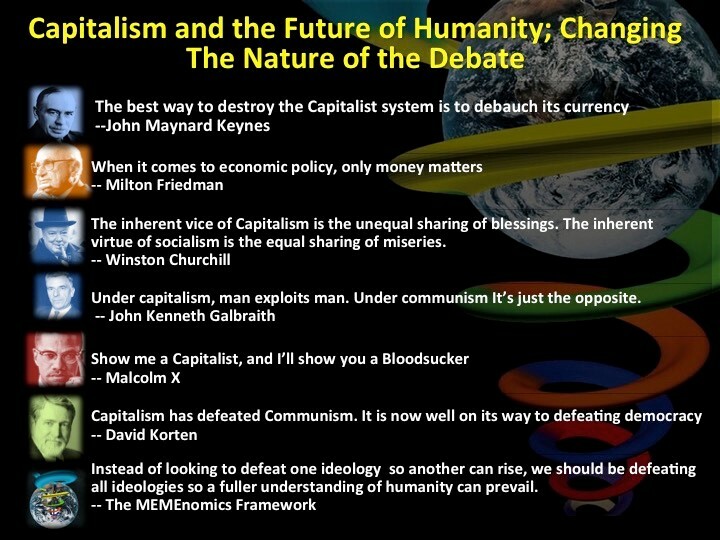 The battle that is taking place on the Western economic frontier today is between the top two ideologies you see here. Keynes is the father of modern macroeconomic thought, which gave the world a blueprint for economic development after the end of WWII. It is a BLUE system that must have a smart government in place (designed from Yellow) to insure the fairness of the capitalist system. The one about only money matters is from Milton Freidman, the father of the Monetarist ideology. Also known as neo-liberal economics. This is the Orange system that says there’s no need for government; the invisible hand of markets provides adequate self-regulation and, in this case, will do so through the use of money. When it comes to global development, here’s the neo-liberal economic thought in a nutshell: There is no problem big enough that can’t be solved by throwing money at it. Orange loves it, and Green is so naïve, it thinks that lending money can bring equality to different parts of the world without regard to where a country is in its stage of development on the Spiral. What the world is experiencing today is the fatigue from that system. In my work, I argue that money is an agent of the Blue system. It is a store of value that must represent current and only part of future productive output. That relationship must be closely guarded in order for finance to serve as an effective lubricant for a complex and inclusive market-based economy. The Monetarists tipped that relationship upside down, and forever corrupted money. You can’t make the oil in your car’s engine become the engine regardless of much money you want to make on selling that oil. This is the classical case of the tail wagging the dog. The continued belief in this fallacy could bring an end to capitalism as we know it. Now, it’s important to understand that this is happening as an unintended consequence of the current system, not as a deliberate effort to return money to its Keynesian Blue role. For better or for worse, capitalism has spawned the seeds of its own destruction by blindly funding everything including the digital economy, which is responsible for much of the disruption we see today. To get a better picture of how this phenomenon emerged, let’s take a look at the evolution of the capitalist system over time. You won’t see this in any books. It’s based on the relevance to cultural evolutionary systems. We started with industrial capitalism, which gave way to post-industrial/service capital-ism, which in turn gave way to financial capitalism. Financial capitalism flooded global markets with capital. It created bubble economies out of every sector and industry. It made rich people richer and poor people poorer. But, because of excess capital (thank you Milton Friedman) and no traditional investment vehicles to place it in, bankers had to create the appearance of legitimate investment. This explained why Facebook was valued in the Billions before it generated a single penny in profit. It also explains the much bigger derivatives markets worth 100s of Trillions of dollars that caused the financial crisis. Now, because more and more of the world is buying into the fallacy of Monetarism, a bubble is unlikely to burst since the old industrial age metrics have slowly disappeared. It is as if the whole world has conspired to corrupt money. China could prove us all wrong if they resist quantitative easing (printing money out of thin air) and pursue a Blue monetary policy instead. 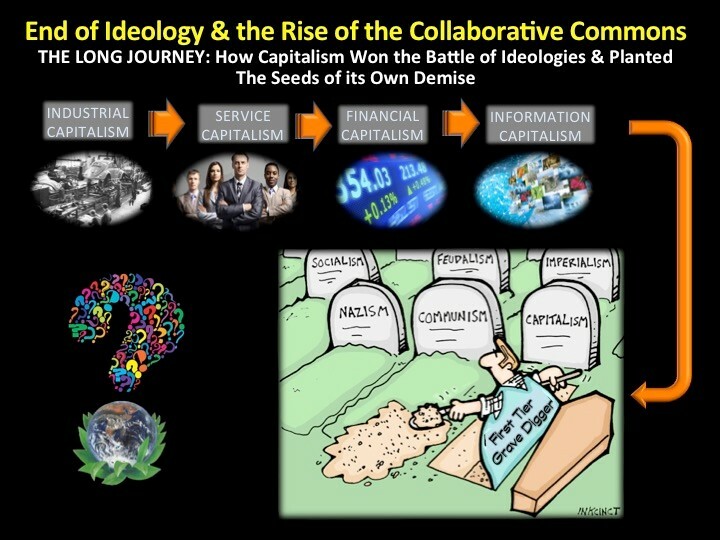 So by funding the knowledge economy or the info-capitalism stage of economic evolution, without knowing its real impact, financial capitalism has sewn the seeds that can possibly spell the end of the capitalist system. 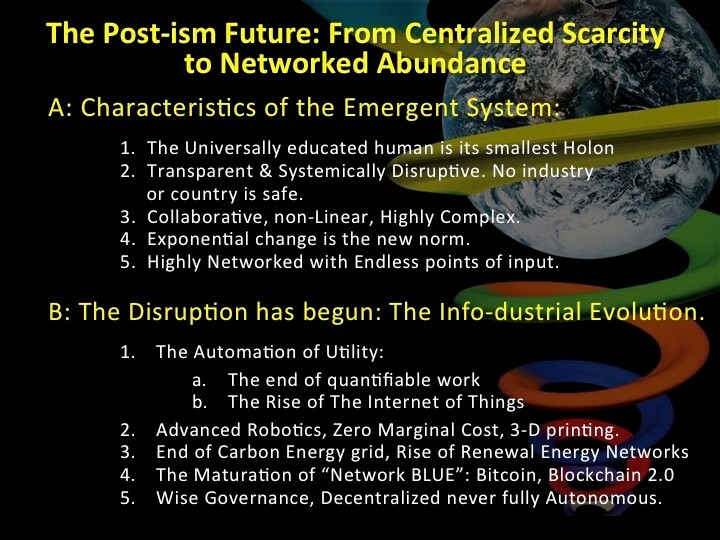 One of the most prominent characteristics of the emerging system is the concept of “distributed intelligence” Its a decentralized system that follows no ideology. So, if we’re beginning to see the end of centralized ideologies, what will the system look like on the other side? Is it intelligent enough to save humanity? The world is facing many existential challenges requiring second tier global leadership. From an exploding world population to climate change and the carbon footprint that threaten the collapse of our entire ecosystem. This is a highly collaborative network that relies on the wisdom of the crowd. We often hear that term but we rarely hear about the stupidity of the crowd or the radicalization of the crowd. ISIS does most of its recruiting through the collaborative network idea and so do many movements that want to mobilize crowds regardless of their purpose. The net effect of this will bring us back to where we are. It is a Green system in its infancy stage, but it’s beginning to evolve. So, as it continues to differentiate its bits and bytes it becomes more functional. It becomes more second tier. The first characteristic you see is a rewording of a quote from Peter Drucker, the father of modern management theory who said that the post-capitalist archetype is the universally educated human being. It is important to understand this because the universally educated human being today is everyone who has access to the Internet. If the system’s smallest Holon is that, then its largest is a universally educated humanity. This is the Global brain that we often talk about in the Yellow-Turquoise systems. The new system is transparent and systemically disruptive. No country or industry is safe. Look at how the Information Age and transparency toppled dictators in the Middle East. Do you think protectionist economies are immune from the same disruption? Highly unlikely. All the characteristics of this system are the opposite of what identifies the current Orange system. Orange is secretive and proprietary; the emerging system is collaborative and open source. Orange is somewhat linear and uses just enough complexity to maintain the scarcity factor and manipulates markets. This system is non-linear and highly complex. Orange doesn’t know how to deal with it when it disrupts a certain industry. Just look at what happened to the publishing industry in the last 20 years. Exponential change is the new norm. Again, Orange needs time to gauge markets, supply, and demand to create scarcity. This system moves at the speed of light and changes products, services, and prices at the same speed. The new system is highly networked. It is open source. If you’re designing a digital platform of sorts you go to bed knowing what it looks like. You wake up the next day and many collaborators from every part of the world have improved on it. This is what the future of work looks like. Well, the disruption is well underway and many thought leaders are scrambling to name it. No, it won’t be a Third Industrial Revolution. It won’t be a Fourth Industrial Revolution. This is what I call an Info-dustrial Evolution. It takes best practices from the last 350 years of industrial advancements, and combines them with the last 60 years from the information age to start a new evolutionary era that to many people looks quite scary. The first area that will continue to be shaped is the evolution of work. This is what I call the automation of utility. Now what does that mean? If your job is quantifiable, it will disappear. Let me repeat that. If the tasks that you perform have a high degree of repeated measurability, your job will not exist in a few short decades. This phenomenon could effect as many as 50% of all professional office workers around the world. The jobs that will be least effected are the ones that require a high degree of personal interaction. What will be rising in their place is what’s being called the freelance economy. The era of the corporation being a major employer is over. The emerging system is App-based, providing highly autonomous work that will make independent contractors out of many displaced corporate employees. We’re beginning to see what that looks like through companies like Uber and Airbnb. This type of autonomy as it matures, allows us to move from a consumer society to a prosumers society, where everyone can participate in producing goods and services and adding to the intelligence of the system in the process. There was a story recently about a Google programmer who made a lot of money, but the hours were very taxing on his young family, so he quit his job and joined a network that does by-the-job contracts in his specific area of specialty. Today he’s a happier man, with lots of free time and mobility to be with his family, making a lot more than he did at Google. This is another aspect of the future of work. We’re also beginning to see the rise of the Internet of Things, making many things in our lives cheaper and more efficient. As the “network” phenomenon grows, an app utilizing society becomes more intelligent. You will see the rise of intelligent cities, transportation networks, appliances and cars that upgrade themselves just like your laptops’ operating system does. Soon you will be able to summon a driverless car to take you wherever you want to go eliminating the need to own a vehicle and disrupting the business model of the entire auto industry in the process. Information combines with industrial innovations to give us advanced robotics. These are robots creating other robots, machinery and products. The factory of the future looks nothing like the one we have today. It is modular and it is very clean. It is a place of assembly located close to your home. There’s no heavy lifting and manpower. The industrial worker of the future sits in a climate-controlled room clicking a keyboard. Because of our ability to create near perfect machines that are cheap to manufacture, we’re beginning to see a phenomenon known as the “Zero Marginal Cost” where products are produced and distributed very cheaply. The best example of this is the evolution of the music industry. Today an artist can produce a song for under $5,000 and be able to sell it on iTunes at no additional cost. By the time the millionth download takes place the cost per download is very close to zero. Unlike the past, there’s no cost of manufacturing CDs, packaging and transportation to a music store that pays rent. The entire industry has been disrupted affecting many other sectors of the economy like plastics, logistics, and retail real estate. Many more industries will be disrupted in the same fashion. It’s just a matter of time. Keep in mind that it is the Millennials (Green, born into this sharing economy), who want nothing to do with our old Orange models. They live the values of “democratization of information and resources”, which define the Fourth MEMEnomic Cycle in my work. The biggest disruptor to the current capitalist system, in my opinion is the 3-D manufacturing phenomenon and the potential that it holds. Take the music industry example and apply it to physical goods. Those microwave-size machines have the potential to end global trade, as we know it. You will be able to produce gadgets and modular parts of all kinds in your own garage, place them on the driverless vehicle for delivery to an assembly facility or to a customer near you eliminating the entire logistical network for finished goods and the need to do trade with China. If you still don’t believe me, let me tell you a story. Two years ago I was at this “Reinventing America” conference in Chicago, where one of the cofounders of this 3-D manufacturing movement told the story of 3 engineers who created a prototype of a motorcycle all made out of modular parts created on 3-D machines in their lab. The styling and performance were far superior to anything that was on the market. BMW got a hold of what they were doing and offered them over $800 Million for their invention. How much longer can the BMWs of the world afford to do this is in a culture that is driven by the values of democratization of resources? The excesses of the Orange system are considered immoral and of lower values in this 4th MEMEnomic Cycle. 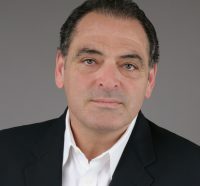 Advancements in technology in the area of renewable energy are also contributing to the obsolescence of the old Orange model and the “centralized grid.” As more regions of the world take the issue of global warming as a serious threat, there will be more investment in renewable energy that will make it scalable. The end of the dirty and inefficient fossil fuel era has begun, and we’re beginning to see the rise of autonomous, prosumer renewable energy networks where you can sell or exchange the excess energy you produce from your solar panels back to the grid, after you fully charge your electric car. We’re beginning to see what I call “the maturation of the Network BLUE” when it comes to things like financial transactions, or legal matters. After the financial crisis and the threat of collapse of the banking system, people were so excited about the whole Bitcoin/crypto-currency phenomenon as a new system of exchange. To me it was still too new and too vulnerable to Red/Orange exploitation. People didn’t understand why I wasn’t in favor of it until the 2014 2 Billion dollar bankruptcy filing of Mount Gox, the largest Bitcoin dealer in the world. Since then the industry has developed many safeguards that significantly improved its Blue accountability and provided the added security that can replace the safety of a bank. Although its foundation is now solid, it still has a long way to go to replace traditional exchange and credit facilitators. The Blockchain technology is a good example of how that network Blue is being developed. It uses sequential transaction numbering that verifies someone’s balances and availability of credit with reference to prior transactions. All developed by a collaborative network that understands the importance of a new virtual Blue system serving real human beings. Everything we talked about so far is about how technology will disrupt our lives. Rough transition at first as we shift to a new paradigm on prosperity with abundance and efficiency at its core. Many people fear that machines and algorithms will replace human beings and our lives will become a mere mechanical function run by mechanical and digital intelligence. It is that Singularity question that many thought leaders like Stephen Hawkin and Elon Musk are concerned about. Those are the futurists not the Ray Kurzweils of the world who place human consciousness at the mercy of technology. In addressing that question I often refer to a quote from T.S. Elliot: “Where is the Life we have lost in living? Where is the wisdom we have lost in knowledge? 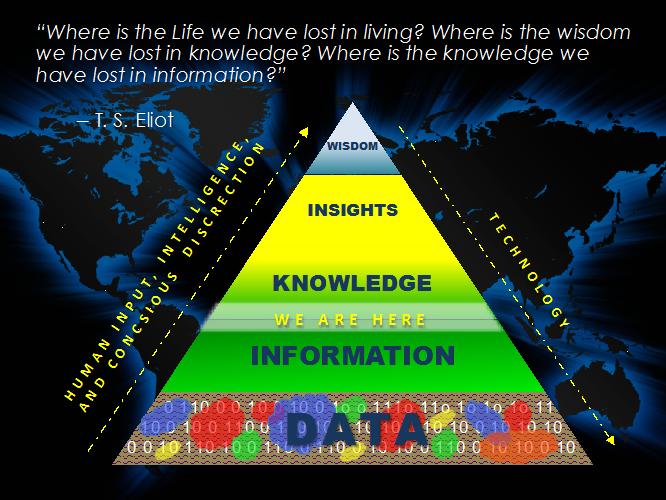 Where is the knowledge we have lost in information?” This Infodusrial Evolution has 3 phases: information, knowledge and wisdom. Human wisdom is its peak. 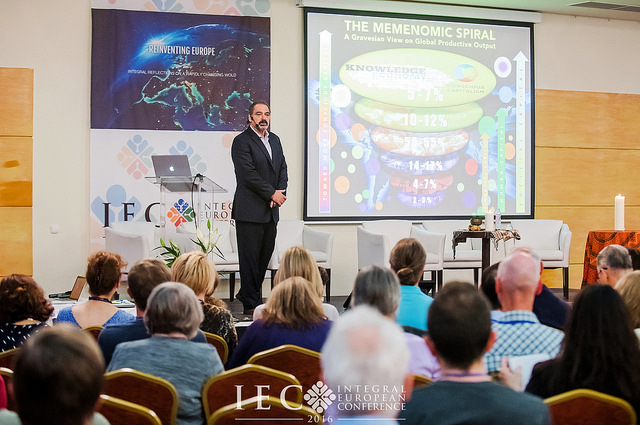 It is important to remember that we are still exiting phase one, the information phase. The Green, raw, BIG-DATA, -everyone has access including ISIS to learn how to build a dirty bomb – information phase. We’re just beginning to enter the STRUCTURED ANALYTICS stage that can be considered Second Tier. This is the functional Yellow system that shapes data and information into knowledge and aligns it to serve the sustainability of the planet, inform global and local governance and allow the needed transparency to build a universally educated humanity. After the disruption from that process wanes, The Yellow system will yield its insights to a much wiser Turquoise system that puts human wisdom ahead of any technology. As you can see on this model, the higher we move towards wisdom, the more distilled the role of technology is. For these reasons alone, issues of governance must maintain a decentralized control structure and not become a fully distributed system. Human consciousness should never be replaced by technology. 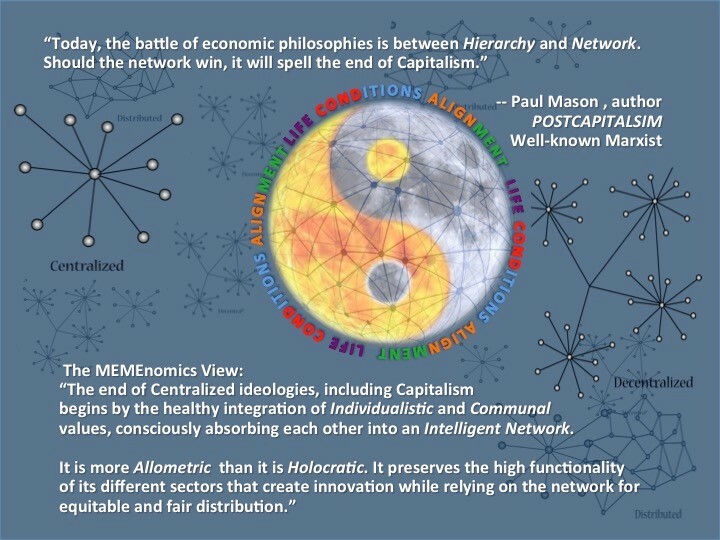 Here’s my view: “The end of Centralized ideologies of the first tier, including Capitalism begins with the healthy integration of the Individualistic and Communal value systems, consciously absorbing each other into an Intelligent Network. It is more Allometric than it is Holocratic. Allometry is from the biological sciences and here’s what it means: It preserves the high functionality of its different sectors, (the specialized organs in an organism) that create innovation, (specialized functions) while relying on the Network for fair and equitable distribution. And that ladies and gentlemen is a glimpse of the future. Thank you all very much. Very odd that a long article titled “If Capitalism is Dead, then what?” could be written without once mentioning, in the text, socialism. Yes, I searched. Twice. Socialism is, of course, the preeminent next step from orange capitalism to green.